Catch the bus from Dent station [Saturdays only] to the village. 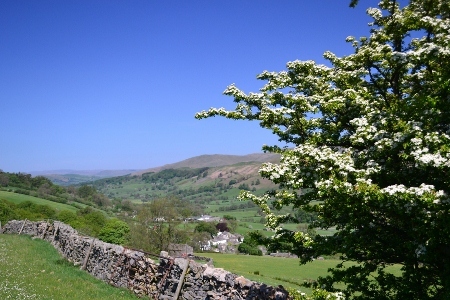 From the bus stop walk away from the village towards Sedbergh for 100m and turn left into High Lanings campsite. Turn right immediately before a barn and over a stile. Proceed diagonally up the hill towards Mill Beck Farm. Passing between the buildings head for a gate. Immediately through the gate bear diagonally left uphill through a succession of 5 fields [look carefully for the stiles]. The path eventually crosses a stile into a wooded ravine. Down to the bottom of the ravine cross the stone bridge and retrace steps of the other side climbing around the bank to get to High House. The path passes to the right of the farm buildings and then joins the farm track for the next 1/4 mile or so. Eventually the farm track reaches the minor road from Gawthrop to Barbon. Turn left uphill for 1/4 mile or so. Turn right at a footpath sign. This crosses open pasture dropping down to a new gate. After passing through the gate bear left up hill. As the main pubic right of way bears right around the contour of the hill continue upwards where there is a gate onto the access land. Pass through the gate and still upwards look for another gate. 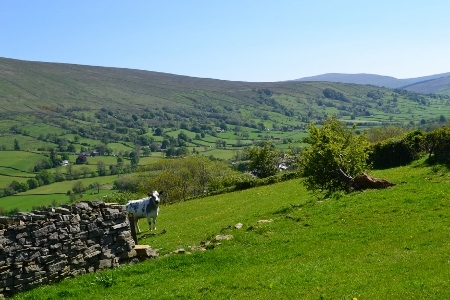 Now on the open pasture above Combe Scar follow the shoulder of hill up to Combe Top. 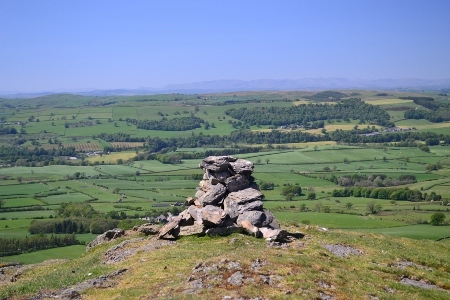 There is a stile near the intersection of two walls. 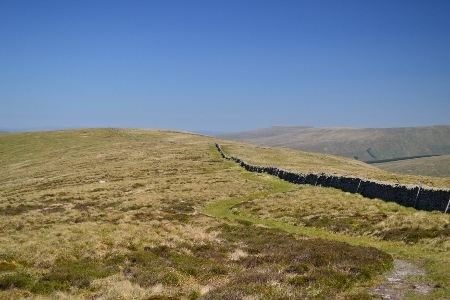 Cross the stile and follow the crest of the hill with the wall on the left for 1 mile. 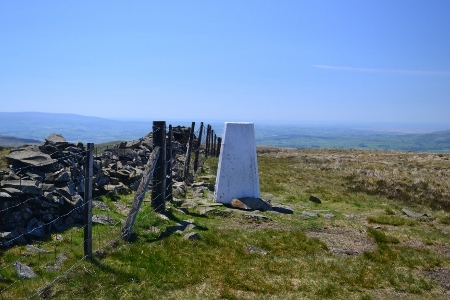 The trig point at Calf Top will come into view now elevated to mountain status. Continue onwards, the path leaving the fence to proceed downwards over open fell along a well used path. 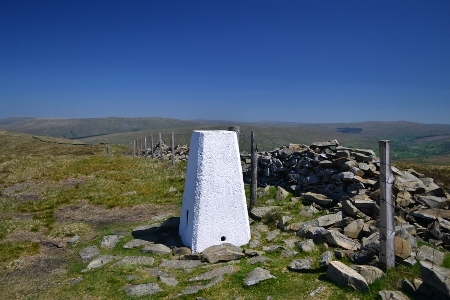 The path now gains height to reach the cairn at Castle Knott. 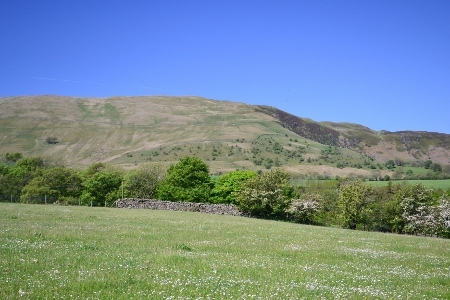 Now bearing slightly right and in a south westerly direction head downhill on the grassy path towards Eskholme Pike. The views here are excellent. 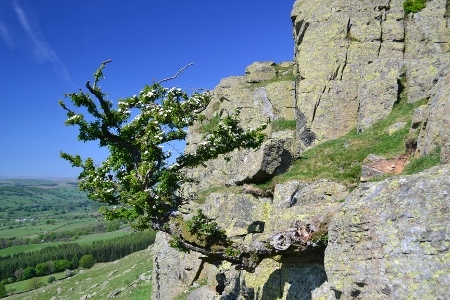 Take care on the steep slope and cross the dilapidated stile over the wall to the left. Now in the parkland for Barbon Manor proceed south towards the village. 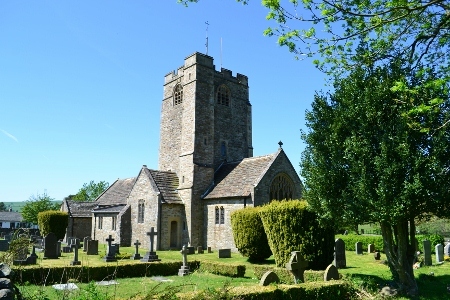 Join the estate road and cross the Barbon Beck to meet the minor road close to the church. Pass through a stile and cross the field to a stile in a copse [in the middle of the field]. Turn left along an enclosed bridleway and then turn right through a gate. The path crosses a field and then across the driveway of a house to emerge at a minor road. Turn right and follow the lane for 400m or so. At a bend the path branches left through two small fields to meet Low Bank House. Pass to the left of the buildings and turn left along a track. Then turn right into a large area of park land. Heading for the middle of the field with Whelrigg House on the left to look for a stile [keep a careful eye open for this]. Cross the estate road and pass through trees on the other side to another stile emerging at a field. Then cross a succession of four fields looking out for the stiles to emerge at a minor road. 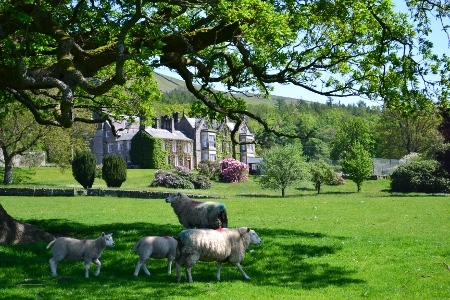 Cross the road at and pass through the garden at Fell Garth. Cross a small bridge and slightly uphill through a stile. Now with the wall on the right proceed across 4 field passing the rear of Hole House. After passing the rear of Langthwaite turn right and walk along the house access track proceeding for 1/4 mile to a road junction . Continue straight on under the old railway bridge of the Ingleton-Low Gill line to emerge in the centre of Casterton. Turn left along the main road. After 1/4 mile at the golf course turn left along Laitha Lane, an enclosed bridleway. After a short while take the right hand fork. At the caravan park turn right passing between the caravans and in front of the shop. The path drops down a grassy hillside between the static homes to a gate and thence onto a minor road. 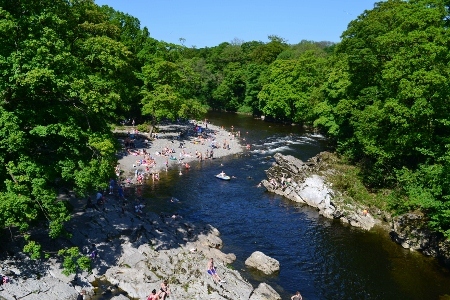 Cross the main Sedbergh Road and over Devils Bridge a popular beauty spot. Shortly over the far side of the bridge there is a footpath into the town centre emerging at the market square. There are a few hostelries the most popular being the Royal Barn with selection of Kirkby Lonsdale beers. 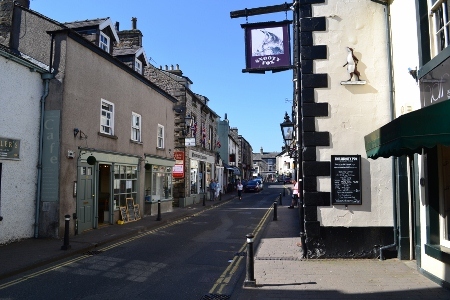 In addition there are a few tea rooms in Kirkby Lonsdale. The 581 bus [Kirkby Lonsdale Coach Hire] leaves from the market place (check bus times). As this is likely to be the last bus be sure not to miss it! Alight in Settle Market Place and return to the station for the train back.